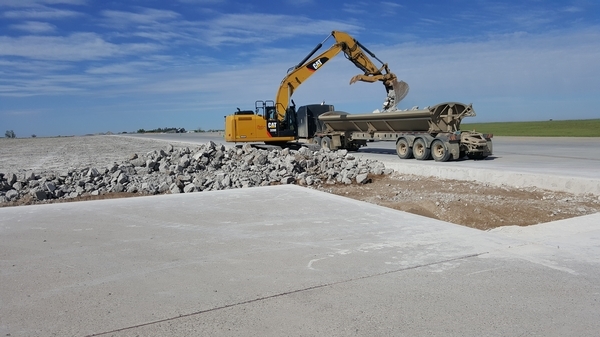 PHOENIX – Workers have laid the first pavement for the Loop 202 South Mountain Freeway, pouring and finishing concrete to widen eastbound Pecos Road where it connects with the Loop 202 Santan Freeway at Interstate 10. This work, part of preliminary construction that began in September, adds to the shoulder of a half-mile stretch where crews are extending high-occupancy vehicle lanes between the Loop 202 Santan Freeway and 48th Street. Next month, this work will move to the median. Using a concrete paving machine, workers poured and finished the concrete last week along the eastbound Pecos Road shoulder. Once the concrete cures, the stretch will get new curb and gutters and place a concrete barrier wall along the embankment. Completing this first phase of work in early 2017 will allow crews to start widening the existing eastbound Pecos Road lanes to maintain two-way traffic flow along the entire Pecos corridor during all phases of construction. Motorists will be able to travel on the 22-mile-long freeway corridor by late 2019. SWCP receives one of the 1st contracts on Arizona's Connect 202 job!